We don’t even watch television that much, maybe an hour and a half per 12 hour day of kiddos, but I seriously cannot stand cartoons. I’m not sure what it is, the repetitive music, the high-pitched voices, the way the most annoying characters get away with the most volatile behavior??? Even cartoons from my childhood have started to take a turn for the worst in regards to their effect on my mood. Brax started requesting Scooby-Doo movies at the library. Thinking that I liked Scooby-Doo when I was little it would be a good choice. I didn’t have a problem with him like I do Dora, Caillou or that big fish from Bubble Guppies that sings “What Time is It?” But now there is even something about that dog and those pesky kids that make my left eye twitch and my blood boil. So what to do? Give up watching T.V. altogether with the minions? I don’t think so. Have them watch it on mute? I tried this, it made Brax stare at the screen even harder and sit closer. So the answer? Watch day time television of course! Shows with real human beings, no animation. Talk shows that entertain. But it turns out day time television is making my life harder, not easier. And here are a few reasons why …. 1. Vaginal Mesh. I have no idea what this is or the use behind it but my four-year-old wanted to know. This inquiry came about during a commercial on day time T.V. about a lawsuit against the use of vaginal mesh. Braxton wanted to know why they were showing a “pee pee” and what “genal mash” was. My answer? A special pair of underwear and turning the T.V. off. 2. Sarah McLaughlin. This is my favorite. Video clips of sad dogs in cages as Sarah McLaughlin’s “Angel” is played and the words “beat animals” is said too many times to count. “Why are those dogs sad? Why are they talking about hitting?” asks a wide-eyed four-year-old. I then had to go on to explain that they are SAVING the dogs from mean people and the animals will be okay. Are you serious ABC, you can’t play a commercial for Pampers or Dunkin Donuts at 12:11 pm on A Tuesday? 3. Dr. Oz. This one would be educational right? With lots of healthy tips and possibly encouraging the kids to eat vegetables, right??? Think again. Rather, I was prompted with questions about what was a diet and what was fat. I’m trying to avoid body issues with my kids not instill them. I’m better off having them watch Unwrapped and crave Twinkies like normal kids do. 5. Last five minutes of soap operas. 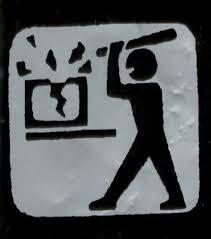 Oh look, Dr. Oz will be on in 5 minutes let’s just turn that channel on until it comes on. Mistake, within three minutes I was answering questions that had to do with a hot and heavy scene between two “naked” guys. Again, at 1:57 pm while the sun was out. Thanks a lot basic cable daytime lineup. I am now forced back to the infamous Disney Junior and PBS Kids until the Halperin kids are old enough to understand vaginal mesh and I have enough free time to Google what it exactly is.